– Keep your documents safe: Do not carry your ID or passport, always leave it at your hotel. A photocopy is usually enough. – Do not leave your luggage or belongings unattended at any given time. – Suspect of anyone that seems to be too friendly. – Do not let people getting too close to you. – Be specially careful of people saying that you have a stain on your clothing, don’t let them clean it as they are probably trying to rob you. – Do not show large amounts of money. – Be careful with people asking for directions, as this is one of the tactics used. Again, don’t let people get too close. – Be careful when withdrawing money from an ATM, always have a look around before withdrawing money. – Call 112 in case of an emergency. The above recommendations may sound a little bit stupid. 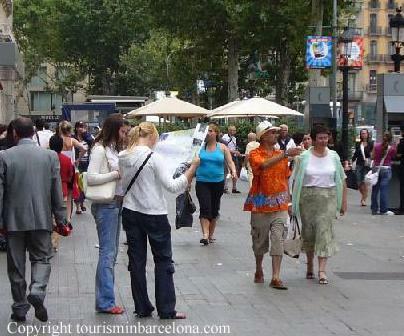 However, people tend to be relaxed while on holidays, so just do what you would usually do at your city. There are also other scams (e.g. trileros) to be aware of. The Mossos d’Esquadra (local police force) has English speaking staff at its Nou de la Rambla police station in case you need it. I would recommend that you mark its location in your map. I would also recommend that you take note of useful telephone numbers in case of an emergency before you start you travel.